The VMware juggernaut continues into Day 2. 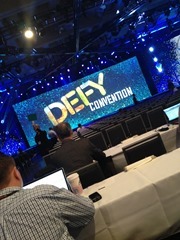 The day started with another keynote. Historically this has always been delivered by the VMware CTO, Steve Herrod who has left VMware for the world of private equity. 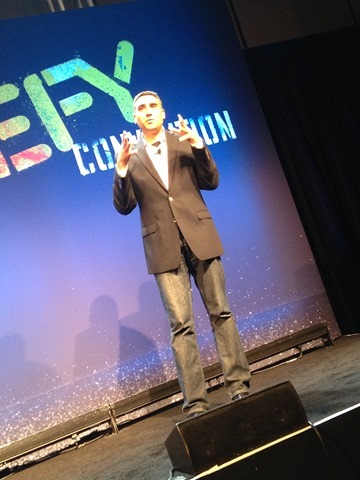 Steve was always knows for his excellent rather more technical keynotes where VMware had the opportunity to show off the techy side of things after the announcements of the first day. with policy based Per-VM storage management with simple scalability. Next up was an EUC demo looking at Horizon Workspace and how easy it is to provision applications and VDI desktops. VMware’s EMEA CTO, Joe Baguley then joined Carl on stage and demoed an automated policy driven proactive response using metrics from vCOPS to deploy new application instances in vCA. This allows you to remediate performance issues while seeing the health of the app in vCAC. vCOPS can give recommendations from many third party data sources and can then recommend for example that you move your storage from a Silver tier to a Gold tier. This remediation could be automatic or fire off an email for approval with cost information included. I then attended the Ask the Expert vBloggers panel discussion which included, Scott Lowe, Duncan Epping and William Lam from VMware along with Vaughn Stewart from NetApp and moderated by Rick Scherer from EMC. It was obviously unscripted and feeding off questions from the audience. The discussion started with NSX and whether network teams are threatened now (shouldn’t need to be, an opportunity to have policy + easier deployment). Hardware is still important, just as we’re moving policy out of the physical switch doesn’t mean you buy cheap switches that don’t perform, the physical layer can be architected for scale and performance without having limitations on logical functionality. A few questions on VSAN, vSphere Replication and SRM integration and then plenty more questions about NSX, this year’s hot topic. There was a question asked as to what people should focus on for the next year personally to grow their knowledge and careers. Vaughn sais there’s still plenty of storage innovation coming, storage isn’t as easy to consume as it should be. William said automation will continue to get a lot of attention, just see the keynote from this morning where the orchestration from vCAC was centre stage. Duncan said you need to take the time to train yourself, a tip was to go to the VMware Communities forums and try to answer questions to help others and if you don’t know, teach yourself. Scott said broadening your knowledge is going to be key as more technologies converge and become implemented in software so reach out to your storage and networking teams for example and get involved with them to learn what they need to do so you can improve what you need to deliver. There was also a question about advanced settings and all panellists agreed that yes you can but there are consequences. The advanced settings are generally there for VMware Global Support Services to assist you in tweaking a setting to fix a problem but it’s dangerous to go and fiddle with the settings yourself. Vaughn gave the example of jumbo frames where the benefit may be not be worth the risk that a new addition to your environment may break the whole jumbo frame chain. Next up was Network Virtualisation: Moving beyond the Obvious by Martin Casado from VMware. 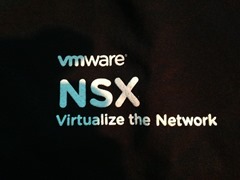 Martin is the guy who developed Nicira which VMware bought and became NSX. He’s a very engaging speaker, obviously passionate about his baby. He went through an introduction to NSX mentioning the design goal of bringing networking closer to the actual application while giving you enormous agility. Taking the concept of server virtualisation into the networking world, you can treat your networking just a like a file which can be snapshotted every hour for example so you can easily roll back changes which would include all state changes, firewall rules, load balancing, routing and switching, powerful stuff! One of the issues with server virtualisation is traditional networking actually loses a lot of the visibility into the vSwitch. NSX addresses this by giving you more visibility and debugging, not less as it encompasses the physical and virtual worlds. You are free to create far more simple virtual networks than the current way of creating large physical but complex networks. Martin showed some future vCOPS integration with a screen showing your entire virtual network infrastructure in the good looking vCOPS graphical GUI. You can easily see where trouble points are in your network and see when a physical components break what VMs would be affected. Another use of snapshots is to create an exact copy of your entire production network and restore in into a test/dev environment, remember, its just like copying a file. I asked Martin about getting traditional networking people involved and on-board with NSX and he said that at the moment there is often a translation problem between network and server virtualisation people where each speaks a different language and its going to take some time to find out that common new language. He said when they do successful engagement, it is by dealing with the networking team rather than bypassing them so he absolutely doesn’t see NSX displacing or making redundant any current network skills you have but adding to them. I then did my second #vBrownBag presentation which was a HP Virtual Connect Quick Deep Dive. I went through some of the designs you can consider from converging networking and stacking chassis together. The obvious mention of making sure your firmware and drivers are at supported versions. I then spoke about design scenarios of carving up your traffic with physical hardware(multiple switches or port group direction), logical hardware (FlexNics) or in software (1000V/NIOC). I talked about the difference between Tunneled & Mapped VLANs and how you should be designing your chassis for maximim bandwidth and all active uplinks. When using FlexNics, create 8 x Ethernet Networks and manage each FlexNic as a separate network and get your ESXi host to do the load balancing intelligence. 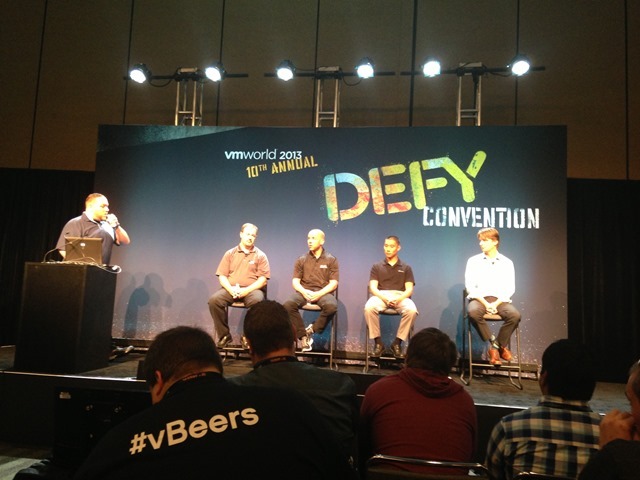 I then attended the EUC Experts Panel – Successful Implementations with Simon Long, Kristopher Boyd, Justin Venezia, Stephane Asselin and Raymond Dusseault all from VMware. A few questions about Graphics Acceleration. I had seen the demo of the hardware and software virtual GPUs on Day 0. A question on updating agents with large linked clone groups. Always update your VMTools first before your VM hardware. Question about ThinApp for Office 2010. Basic recommendation is to put office into the base image as it is one of the most complex things to virtualise. Interesting topic is active/active desktops where you can split your VDI environment between two sites but be able to desktop persistence. You most likely need to have separate instances of View, separate pods as well as composers as View is very sensitive to latency issues for broker communication. This could be load balanced with F5. Persona management is also difficult to implement, maybe use DFS as you need two way data replication. It was mentioned that you can have a maximum of 100 HTML sessions per connection server. Someone couldn’t do install of a View client at a remote site so perhaps ThinApp could be a solution. Interestingly, most of the questions were all about things that happen inside your VM rather than the Horizon View infrastructure itself. This reinforces my opinion that we need to banish the I from VDI as this references the Infrastructure part which is pretty easy to deploy and the actual work is making sure your VM image is as best it could be. Talking EUC, VMware has announced a Tech preview of Project Orcha which is to allow secure file access from a tablet so you can seamlessly open the file in a Horizon View desktop and remote the user interface back to the tablet. I then went to the combined vExpert/VCDX Reception to meet up with the many awesome people we are lucky to be able to call our respective communities. I then went on to the Virtual Instruments function. Virtual Instruments provides visibility into real-time performance, health and metrics. Next up was the legendary Veeam party, never to be missed at VMworld and lastly the #vBacon party.